Here is our all new matched betting calculator perfect for working out all the stakes you need to maximise the returns from your risk free betting. 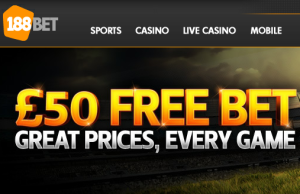 Sometimes it pays not to hold out for a new bookmaker sign up offer as you could be missing out on what they are offering their existing customers. 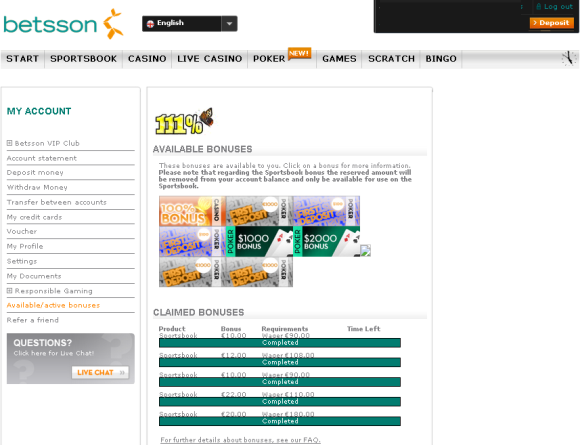 This is certainly the case with bookmaker, Betsson. A company that we have been with for a little while now, and whilst they don’t have a current joining offer they have more than made up for that over the last few weeks with offers sent direct to our inbox as an existing user. Look at some of these recent invitations…. So with this in mind we have given this bookmaker the full Oddsmatcher & Oddsmatcher Pro treatment so that once you have joined and placed a couple of bets to get you started, when the offers start arriving you will be all set to make some more instant risk free profit. Another chance to crack open the Refund Spreadsheet again this weekend, as after the locked in profits on the Manchester Derby on Monday we have some more opportunities, this time centred around the Chelsea v Man City FA Cup Semi Final on Sunday. A very quick post as we have been asked to summarise how to lock in a guaranteed profit on the Betfair fixed odds cashback offer on the Manchester derby tonight. Place a Sportsbook bet on Chelsea v Man City before kick off (ITV, 16:00 Sun). Your bet must be on First Goalscorer, Last Goalscorer or Correct Score. If Man City beat Chelsea (90mins) and the first bet you place loses, we’ll refund your stake, up to £/€50! Money back on losing bets in ALL markets up to £25, in the form of a free bet token if Manchester City beat Chelsea in 90 minutes in the FA Cup Semi Final: Chelsea v Manchester City on 14th April 2013. Offer is available to new and existing online, phone, mobile and shop customers. Offer applies to single bets only. Refund will not apply to any multiple bets. Offer applies to losing bets on ALL markets of the FA Cup Semi Final: Chelsea v Manchester City on 14th April 2013. Offer applies to bets placed in 90 minutes, this includes injury time but not extra time or penalties. Only single, losing bets on the following markets qualify for the free bet refund, 1×2, Correct Score, HT/FT and Winning Margin. For the Betfair offer then the simplest way is to BACK and LAY an outcome in the Correct Score market where City cannot win and then LAY City in the regular 90 minute market to lock in some risk free profit. 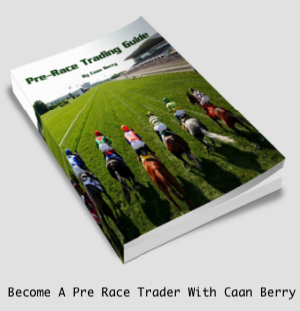 Or even combine the offers to give you some great pre match trading positions and take them in play. There are so many options, brilliant! 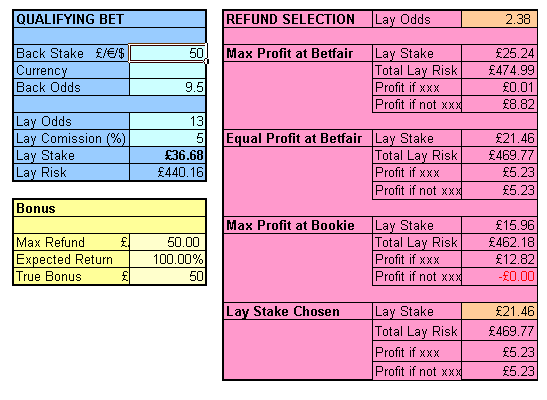 So here’s an example from our ‘What…If….’ refund spreadsheet using the Betfair offer as an example….. In the above example we…..
And of course you will be needing some accounts to get you started…. The brilliant BetRedKings risk free offer Away Sunday has been moved to Friday this week to cover the International card. It is still called Away Sunday though, maybe Away Friday doesn’t have the same ring to it. Anyway make no difference as it is still a few extra quid risk free for us! This is fairly typical of the risk free profit you can expect from this offer every single Sunday (Friday, no Sunday) of the season, not bad eh. And when you consider this is just one of many existing user offers they have running, it’s well worth having an account. Here’s the details of this weeks offer….. Bet on the away team on one of the games above and if they lose, we will give you your stake back up to £20 (€20, $30). Stake will be given back only for 1 game so if you make more than 1 bet on the above games, only the first one counts. Stake is given back only if the team loses. If there is a draw, then there is no money back. The Moneyback is given into your bonus balance and you need to wager it twice with odds 1.5 before withdrawal. Only bets made from Real Money balance count towards this promotion. Only pre-game bets on 1×2 market count towards this promotion. You need to claim your moneyback from accountmanager@BetRedKings.com within 7 days of the settled bet. 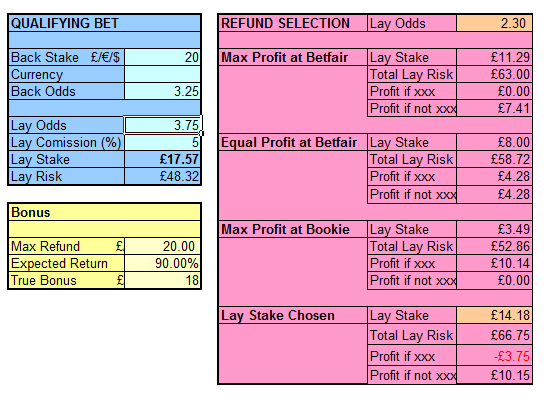 All fairly easy, just back / lay the away side of your choice and then lay the home side to lock in some risk free profit. Here’s an example of what we did on the Serbia v Italy game…..
To lock in £4.28 profit. Note that we have set the refund value to 90% i.e. £18 as it has to be wagered over x2 when you get it. Although doing the one from last weekend on the horses we retained 98% of it thanks to some very good match up in odds so worth looking at the horses if you can to do this. At the time of typing you can lock in about a fiver on the Tottenham / Arsenal game. This is fairly typical of the risk free profit you can expect from this offer every single Sunday of the season, not bad eh. Is Sunday the day to celebrate the Away teams? Is your favourite team the underdog and not sure if you want to bet on them? BetRedKings Away Sunday is the solution. Make a bet with our moneyback guarantee. Choose one of the games below to bet on the away team to win and if they lose, get your money back! * Bet on the away team on one of the games above and if they lose, we will give you your stake back up to £20 (€20, $30). * Stake will be given back only for 1 game so if you make more than 1 bet on the above games, only the first one counts. * Stake is given back only if the team loses. If there is a draw, then there is no money back. * The Moneyback is given into your bonus balance and you need to wager it twice with odds 1.5 before withdrawal. * Only bets made from Real Money balance count towards this promotion. * Only pre-game bets on 1×2 market count towards this promotion. You need to claim your moneyback from accountmanager at BetRedKings.com within 7 days of the settled bet.